Anyhow – the inspiration. A short while ago, Inhabited Kitchen had a sudden, unexpected surge of visitors from Buzzfeed. 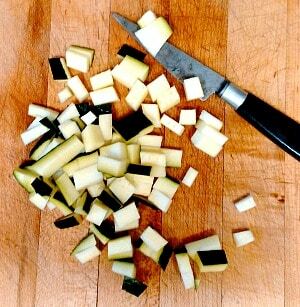 I was somewhat flattered to discover that a staff writer had linked to an old post about roll cutting zucchini, and had specifically directed readers to that post for instruction. 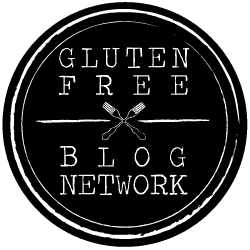 So this was very nice and all – and welcome to any of you who discovered the blog through it! – but it also made me realize that it was nearly three years since I wrote that. And, well, most of you joined us more recently, and probably have not carefully read three years worth of archives… (I mean, thank you if you have, I hope you found them useful!) and when I wrote that I was still publishing on Blogger, and I didn’t yet know much about SEO and writing clear titles that help you figure out what I’m talking about. (And I didn’t know anything at all about taking or editing pictures…) So perhaps it is time for me to revisit some of the fundamental techniques I wrote about in the first year of the blog – when no one was actually reading it yet. I have several zucchini in the house…so this is a good opportunity. Let me start with that roll cut. I have mentioned it in passing, over the years, because I use it all the time. 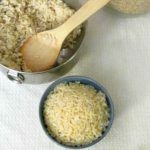 I don’t think that it speeds up the cooking, particularly (which the article said) – but it allows the food to cook very evenly and improves the texture. Before I learned this, I used to cut zucchini, carrots, and other long round vegetables in coins, and then cook them – and they would go mushy. 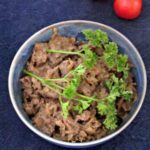 The roll cut gives you lots of surface, all very even – it is particularly wonderful in a saute, where you can brown and season that surface. 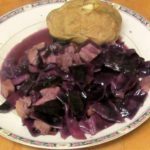 It’s great for stews and other long braises, too – your vegetables are tender, not mushy, and absorb the flavors they cook with. 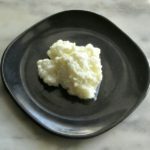 I use the technique for zucchini, carrots, asparagus, daikon and other long radishes, but not layered vegetables like scallions or leeks – they’ll fall apart. 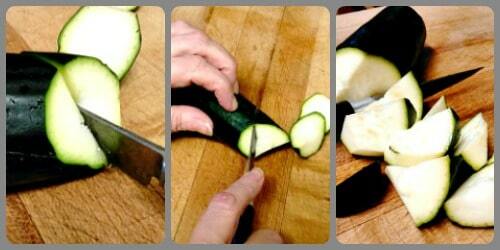 Cut the stem end off your zucchini, then hold your knife at an angle, and cut a wedge shaped piece. 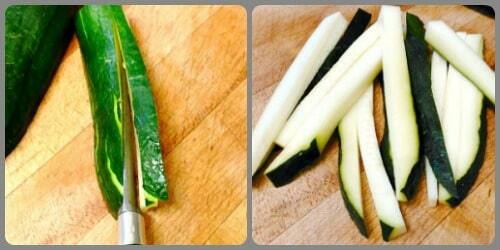 Then roll the vegetable slightly toward you, continuing to hold the knife in the same position – and make another cut. 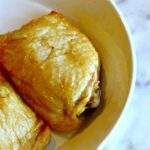 Roll again, cut again, and so on… You end up with a pile of oddly shaped, many sided chunks, that cook beautifully, and add interest to your food. I highly recommend it. Now, let us move on to a series of techniques that build on each other. First, the easiest, most interesting, and most unusual (Isn’t that a nice combination?) – the fan cut. I’ve used this for zucchini, but also for small eggplant, carrots, and radishes. Start by trimming your vegetable – cut off stem and blossom ends (and of course any damaged spots) and, if needed, cut it into manageable pieces. This zucchini was just large enough that I cut it in half across, and then split it again lengthwise (which gave me a flat surface – I recommend that you do this even with a small vegetable until you get the hang of this – it’s easier.) When I cooked the baby eggplant in the link above, I kept them whole. Now, place the piece on the cutting board, and starting a little in from the end, cut a slice down all the way to the other end, so that it remains attached at just the first end. Continue doing this until the whole piece is sliced but holds together at one end – essentially, at the handle of the fan. And now – take your pile of matchsticks and cut them across, in pieces the same size – and you have dice. Why would you do that to an innocent squash or carrot? 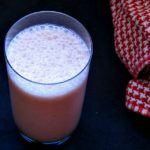 Well – think of packaged peas and carrots – they cook quickly, and are the same size, which can be useful in soup or sautes, or, perhaps, an omelet. 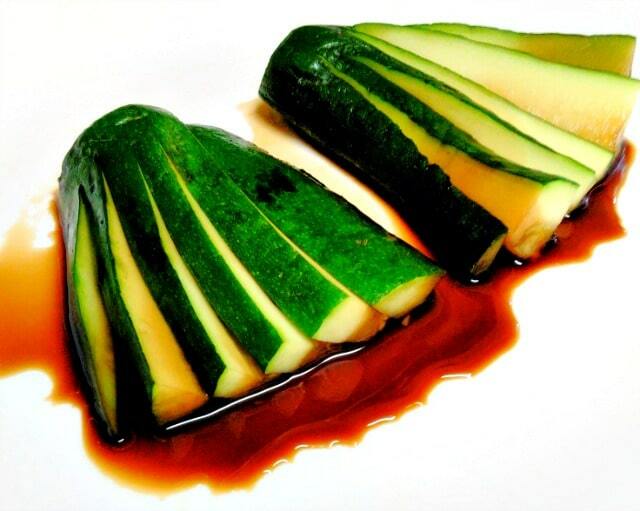 Or, you can toss the zucchini dice with a little vinegar, let it marinate a while, then add it to salad, or pack it for lunch. I don’t dice these vegetables often, but it is good to remember the option. Or you can cook seasoned simmered fans. I use a fry pan for this, as it is flat, and put about half a inch deep of seasoned simmering liquid in it. 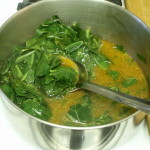 That can be broth, it can be juice (orange juice would be a nice way to cook a big, fat, tough carrot.) I used water with a splash of rice vinegar and tamari. Since there is a flat side, I put that down, and added the cold liquid to the pan, then quickly brought it to a boil, and let it simmer zucchini five minutes (covering the pan the last minute or so, to let the top steam) until done to your taste. Remove the vegetable carefully, so the fan handle end doesn’t break, and place it fanned out attractively on your plate. If you want, you can drizzle it with the cooking liquid. 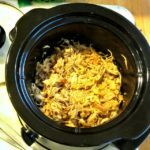 It’s not all about being, well, attractive, though that’s a feature – you get a nice subtle contrast in flavor and texture between the part in the simmering liquid and the rest. And it looks and feels quite elegant, though it’s really pretty simple. Learn knife skills and select a method for cutting vegetables that gives the best result in your specific recipe - from slice and dice to zucchini fans! 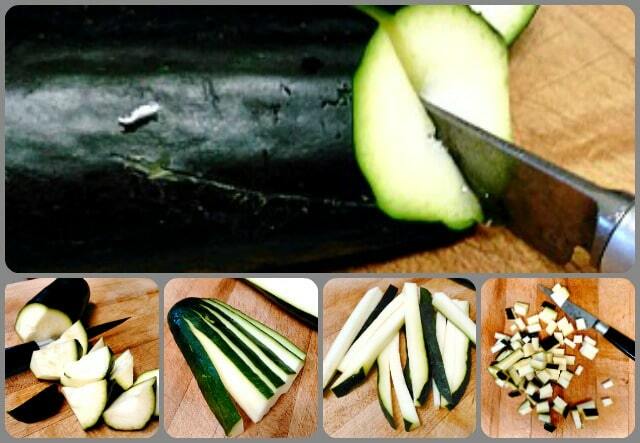 Wash zucchini, and trim off stem and blossom end. Cut it in half crosswise, then again lengthwise. 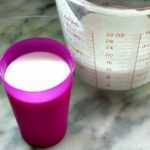 Carefully slice each piece from a quarter to half an inch from the end all the way down to the other end, with cuts about a quarter of an inch apart. Place, flat cut side down, in a fry pan. 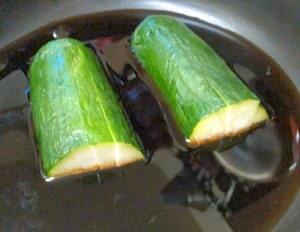 Add remaining ingredients, which will not cover the zucchini, and bring to a quick boil. Lower heat and simmer about five minutes, or until cooked to your taste. 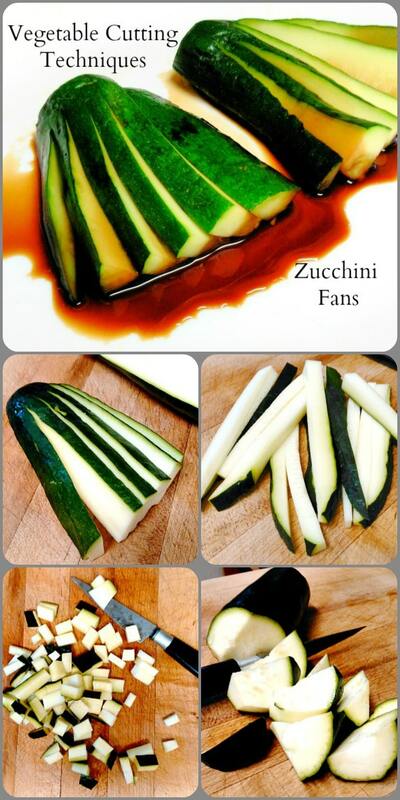 Carefully remove zucchini from the pan without breaking, and fan out over the plate. Thank you. I don't have a mandolin, do have a food processor that gives me reasonable slices - but only use that if I'm really doing a ton. There are two of us. It's more a hassle to get out and wash the tool than to just use the knife... And it's just plain useful to know how to do this, even for someone who does use a mandolin. Besides, the fans are fun. Great post here! Very valuable information, and I'm loving the look of those fans! Oh my knife skills always need work - thanks for the tips! It's really just knowing a few techniques, and practicing. Honestly, I know trained cooks who would be politely dismissive of anything I do as "knife skills" - I rather hesitated to use the phrase - but mine are good enough for home cooking, and it's just useful to know these things. LOL - I'm in a different place than many. Websites and photography were mysteries to me, but I'd been seriously interested in cooking for years. And I've been in the food and cookware business, where I've been able to talk to, observe, and learn from professional cooks with serious training. 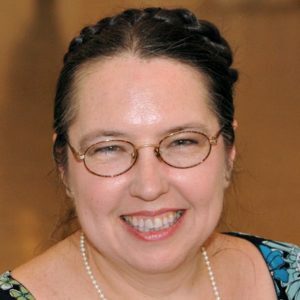 (I'm also older than most bloggers, which has given me more years in which to learn.) 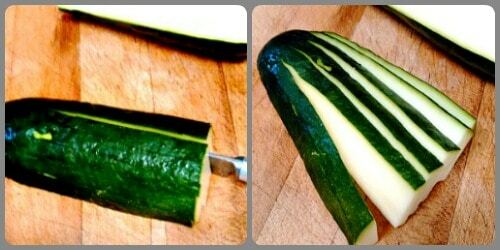 So I've cut my zucchini like this for a good 15 years - that's easy for me - but getting a halfway decent picture of it? Now that's hard... So we all learn from each other, don't we? I'd seen it years ago in a book - but when I tried to track it down for an earlier post, it turned out not to be the book I thought I remembered... so I can't give credit. I've done it for ages, though, because I like the way it cooks, it looks so elegant - and it's really easy... which is a nice combination, now, isn't it? This is great! I keep looking at those zucchini spiralizers, but I think I'd rather just improve my knife skills!